Just because the Rugby season has ended for 2018 doesn’t mean the good times have! Be sure to join us at any of the activities below this off-season for a fun time with the extended Vikings family. The Canberra Vikings play their final home game of the year at Viking Park on the 29th of September from 6:30pm. Come and join us at the Red Army Bunker for some food and drink. President Brendan ‘Trendy’ Allardyce and Committee Member Stef ‘Champion’ Stewart-Jones will also be celebrating their birthdays on this night, too! The Queanbeyan 7s will be played on Saturday the 13th of October. We will be entering a Men’s and Women’s team. The Men’s team will train on the Wednesday prior – any interested players please contact Ryne Bowden (ryne.bowden@vikings.com.au). Any players interested in playing in the Women’s team please contact Stef Stewart-Jones (stefanie.stewart-jones@griffinlegal.com.au). We will head out for dinner and drinks as a group following the tournament. The NRC Grand Final is on Saturday the 27th of October, with the Canberra Vikings a strong chance of playing in this game. If the Canberra Vikings host a home Grand Final, we encourage all Vikings fans to head down to the Red Army Bunker and help us cheer on the boys. If they play an away Grand Final, we encourage all fans to head over to the Sideline Bar at Erindale Vikings and watch along. The Academy/WTG players will be participating in a touch tournament of their own on Thursday evenings, amongst themselves. We’d like to encourage all current and future Vikings/ViQueens who aren’t training in the Academy/WTG/WRAP to come down and also play a game of touch, every Thursday from the 8th of November until December. And don’t worry – our tournament won’t be as competitive or as focused on conditioning as the Acadmey/WTG/WRAP tournament! We’ll put a BBQ on for everyone that comes down to join us afterwards, too. 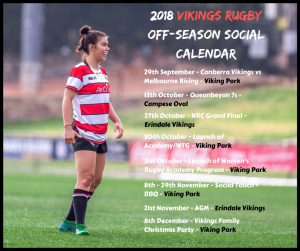 Vikings Rugby continue their hugely successful Academy and WTG programs for the 2019 Preseason. The Academy and WTG squads train Monday, Tuesday and Thursday with each session consisting of a weight’s session followed by skills or conditioning. These sessions are a great opportunity to prepare for the 2019 season and gives players the opportunity to develop under the Vikings elite coaching staff. Selected players will be notified of their inclusion in the Academy/WTG prior to the launch, with sessions commencing on the 5th of November. 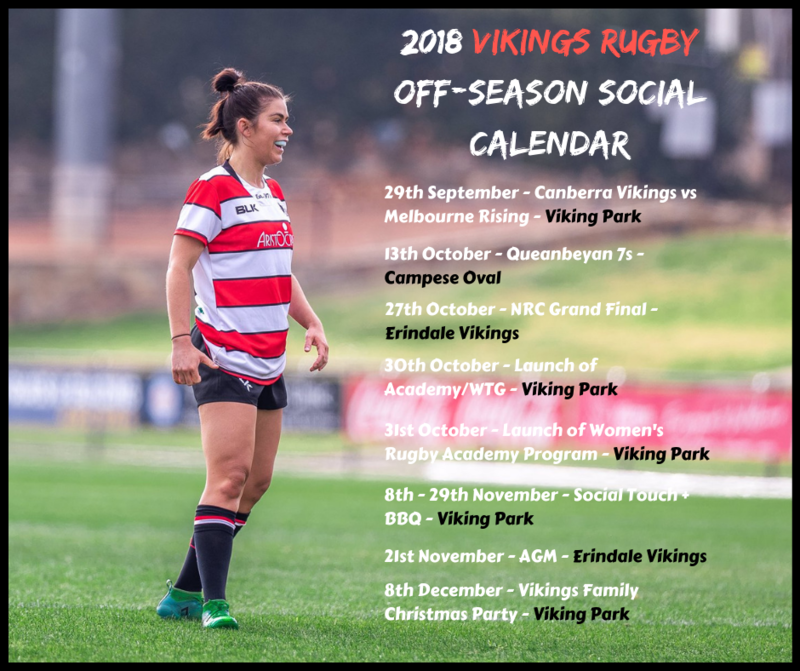 Vikings Rugby are thrilled to launch an exciting new program for our ViQueens – the WRAP, which will run parallel to the Men’s Academy and Wider Training Group. The WRAP will train for 2 hours on a Wednesday and participate in skill blocks and strength and conditioning. This is an exciting development for our Club and for Women’s Rugby in the ACT. Selected players will be notified of their inclusion in the WRAP prior to the launch, with sessions commencing the week after on the 7th of November. The Vikings Family Christmas Party will be held on Saturday the 8th of December (time TBC). Our Christmas party will feature a jumping castle for the kids, a BBQ, drinks (alcoholic and non-alcoholic) and a ton of fun and laughs. Everyone associated with our great Club is encouraged to attend. Stay tuned to our social media and website for more info.